Outlaw Star Remastered Collection from All the Anime. It was originally pencilled in for this summer, but problems with materials and subtitle timing meant that it was pushed back to the end of the year. A response on Facebook reveals that it has been pushed back yet again, this time to the end of February for the same reasons one more. My first review of the week showcases Naruto’s final appearance of 2013, in Naruto Shippuden Collection 15. We’re almost at the 200 episode mark of the second series featuring the bright orange ninja, and even though we’re well behind the broadcasts, it’s still going strong. By this time, they really have the animated ninja-ing down to a fine art, as this collection may be comprised solely of filler, it still manages to hit the spot that other animated ninja shows can’t reach. Click the review to read about the terror that is the ninja ostrich! Then it was Ichigo’s turn to bow out of 2013, also with a flash of filler. Bleach: Series 12 Part 2 signals the departure of Manga’s logo from Kazé’s disc and packaging artwork, but that’s about as drastic a change as you’re going to see in this release. Bleach is still the bane of my reviewing existence, always doing just enough to tip me into watching the next episode, but always making me regret doing so. Just when I thought the filler might be more interesting than the main series, it delves into tedium again, before perking right back up with one of those infuriating cliff-hangers. Gonzo have this reputation in my DVD player of having a real problem in ending their series satisfactorily. They can build up an intriguing story, great animation, develop an interesting premise, and then suddenly realise that they’ve run out of time two episodes from the end, and go all guns blazing, throwing everything they have at the screen in the hope that something might stick. 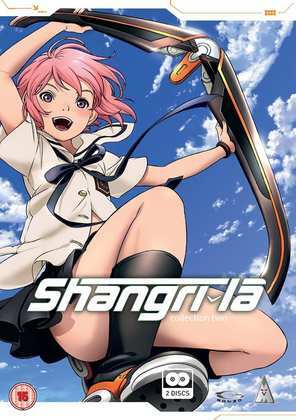 Shangri-La was and is still one of the best shows they’ve made, both in terms of visuals, and in terms of character and story. Surely they weren’t going to pull another Gonzo when it came to ending this story? Click on my review of Shangri-La Part 2 and find out. With all that mediocrity and comparative disappointment, I needed something top class to perk me right back up, a show to remind me of just why I love this medium so much. 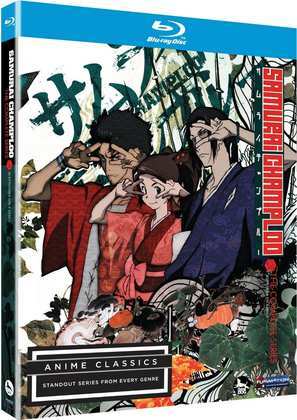 So I watched Samurai Champloo again, this time on Blu-ray. It may be an SD show, but it looks mighty find scaled up to HD, and lossless audio is a definite selling point when it comes to the show’s eclectic hip-hop soundtrack. But it’s a show from Shinichiro Watanabe, the creator of Cowboy Bebop. That’s why you’ll be importing Samurai Champloo: Anime Classics Edition on Blu-ray before you know it. To round the week off, it was the review of Penguin Drum Part 2. I reviewed Part 1 when it was released, and to tell the truth I had too many problems with the discs to really appreciate the content. When you stop reviewing the show, and start reviewing the distributor, it’s time to take a step back and get a second opinion. Stuart McLean provides the opinion for Penguin Drum Part 2, and this time he reviews the show and the show alone. Honest! 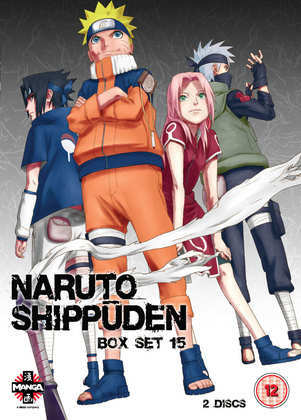 Naruto Shippuden Collection 15 came out on DVD last Monday from Manga Entertainment. 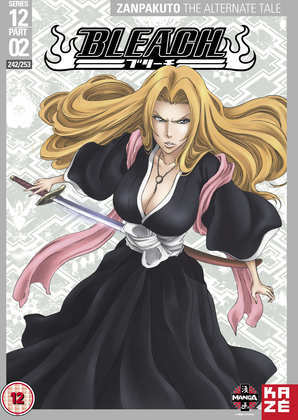 Bleach Series 12 Part 2 on DVD was delayed by Kazé Entertainment, just as I finished writing my review, to the 23rd of December. 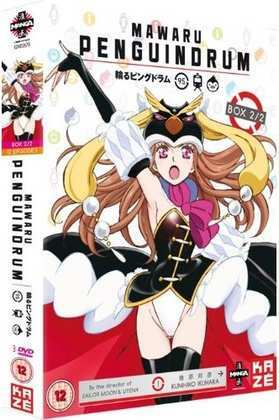 Kazé also released Penguin Drum Part 2 back in October.Shangri-La: Part 2 comes out today on DVD courtesy of MVM, while Funimation released Samurai Champloo: Complete Series Anime Classics on Blu-ray back in 2011.